I didn’t know I wanted to be an accredited investor until I found out what an accredited investor was. It was 2014. I had just started my new job at Facebook and was starting to get more into personal finances. After having been laid off from my first tech job, I had a newfound respect for reaching financial independence quickly. As you can imagine, there is a lot of wealth in Facebook, so investing is a common topic. One day while roaming around for events happening on campus, I found out a private equity firm was coming to explain its company and investment approach. At this point in my life, I didn’t really understand private equity. I had a few classmates from business school going into the field, but I knew very little of what investing in private equity looked like. But, I knew it was for “big money” and I wanted to learn more. After hearing about how the private equity firm invested in companies, what a profitable event looked like, how investors made money, management fees and the firm’s track record, I thought it would be cool to try it out. In general, once I have a basic understanding of a new type of investment and it looks appealing, I’ll put some money into it and watch it. It helps me understand if this new type makes sense for my wealth building strategy but minimizes my risk up-front. If things look good and it feels right, I’ll continue to invest in that area. So, the firm’s representatives and I schedule a call to talk about investing in its fund. At this point in my life, I feel good about the $10,000 I have to invest. Ten stacks is a good amount of money, and I was excited to get on the phone and start throwing around “big” numbers. Oh, how naive I was back then. After answering some more questions I had about the firm’s investment strategy, how it identifies companies, and the price of fees, I start talking about investing. I want to understand the process. Fund Associate: Well, Mr. Peters, are you an accredited investor? Me: Accreditation? Is there some Investors Institute of America that’s giving accreditations? FA: Uh, no. You have to meet some criteria set by the US in order to invest with us. Me: *thinking in my head I got this. I got 10k, have an econ degree and MBA, and have traded for years! * Oh, sorry. I didn’t know. What are the criteria? FA: Well, since you’re married, just make $300,000 a year or have a net worth of $1 Million, not including your house of course. That’s it. FA: Don’t worry. There are other means of becoming accredited. The main thing is meeting the investor minimums of $250,000. But don’t worry, we don’t have a hard cap so you can always invest more than that. Me: Oh damn. Forgot about this meeting. Email me these details, and let’s talk again soon. Let’s just say that one call suddenly changed my perceptions of the wealth walking around me and the money mindset I needed to adopt. At this point in my life I had been investing in stocks, ETFs (Exchange Traded Funds), a robo-advisor, and real estate for years and just spent two years studying business at MIT. I thought I had made it and was ready to invest my $10k. I realized I was still playing in the minors that day and went to lunch to eat some humble pie. I followed that pie later with a “hustler” latte and picked myself back up. I started to spend time understanding this new level of accreditation, what it would mean for me and how I was going to get there. In the United States, an accredited investor is allowed to invest in unregulated securities and has proven herself sophisticated enough to understand the risk of making the investment. There are several “tests” you can pass to become an accredited investor, but the most common are the income and net worth test. If you earn $200,000 or more a year as an individual or $300,000 or more as a married couple, you are an accredited investor. Failing that, if you have a net worth of $1 million or more, not including your personal home, you are an accredited investor. There are six other ways you can pass in the United States. A few years ago, the definition of accredited investor was amended. You are now able to demonstrate enough knowledge to achieve accreditation. Now, financial advisors and those with demonstrable knowledge as verified by FINRA can be considered accredited investors. There is literally a glass ceiling when it comes to investing in the US. Well, it’s not glass, because you can see it. Now, I do think it makes sense to have limitations in place, especially when you break down regulated vs. unregulated securities and understand the knowledge it takes to understand unregulated securities. Companies listed on markets like the New York Stock Exchange (NYSE) or NASDAQ go through a lot of regulation and compliance to become regulated securities. Their accounting books must be kept a certain way, they must open up their internal finances to investors and the public, and there are ratings agencies that go through and give their opinion based on these reports. This adds a lot of confidence as an investor in regular stocks and bonds. Now that you understand what meets the definition of an accredited investor, let’s understand what type of investments this status unlocks. What Unregulated Securities Can an Accredited Investor Invest In? What exactly are the types of investments the SEC is trying to protect people from? What falls into this special asset class reserved for sophisticated investors? Unregulated securities are usually for smaller companies who can’t afford the cost of going through regulation. As a result, investors need to do more due diligence to understand the risks and benefits of what they are investing in. Unregulated securities include things like investing in a startup/private company, which is a high-risk, high-reward investment. There is a high chance you will lose all of your investment investing in startups, compared to the significantly lower risk carried by public companies, but the chance for an outrageous 100x return is more likely. Hedge funds, private equity, venture capital and private real estate funds fall into this category, but there are many more examples. But, with a new innovation spree in financial services and fintech, we are seeing many new online offerings come to market. Below are a few I’ve personally been researching. RealtyShares is one of several new crowdfunding real estate websites. If you are an accredited investor, you can access the site’s platform to find out about real estate investors and investment firms that are looking for investors for specific deals. At a basic level, if you’ve ever seen “Flip or Flop” and heard them talk about “our investors,” well, RealtyShares makes it more accessible to become the investor. But instead of flip or flop, it’s more like $15M office building or flop. RealtyMogul is another crowdfunding real estate investment website offering the ability to join with other investors to make larger investments. The site offers commercial and residential investments. RealtyMogul also offers a REIT open to non-accredited investors. FundersClub allows you to invest in startups like an angel investor. The company runs some venture capital funds that you can invest in to get access to multiple companies, or you can invest in specific companies as they come up. There are options for non-accredited investors, but not as many as there are for those who are accredited. SeedInvest allows you to invest in startups and is similar to FundersClub. These are similar to crowdfunding sites like Kickstarter because companies are looking to raise money to get started. But with Seedinvest and FundersClub, you are buying a portion of the company and not just a pre-order for a product. Coinbase is one of the bigger, and more secure IMO, cryptocurrency exchanges out there. Cryptocurrency may not make sense for your portfolio, but if it does, its index fund will keep you diversified across the coins traded on their exchange. Do I Need to be an Accredited Investor to Build Wealth? This is a personal decision and varies depending on your goals and plans. There are many paths to wealth and most don’t require you to become accredited. There are many who built their wealth just by saving, investing and working. Using 401ks and IRAs and investing in nothing more than the stock market, many have been able to make millions and achieve financial freedom and generational wealth. For those (like me) who are very into their finances, maximizing their returns after adjusting for risk and actively trying to really put their money to work, becoming accredited does open a lot of new opportunities. There are companies I can’t even talk to until I tell them I’m accredited. 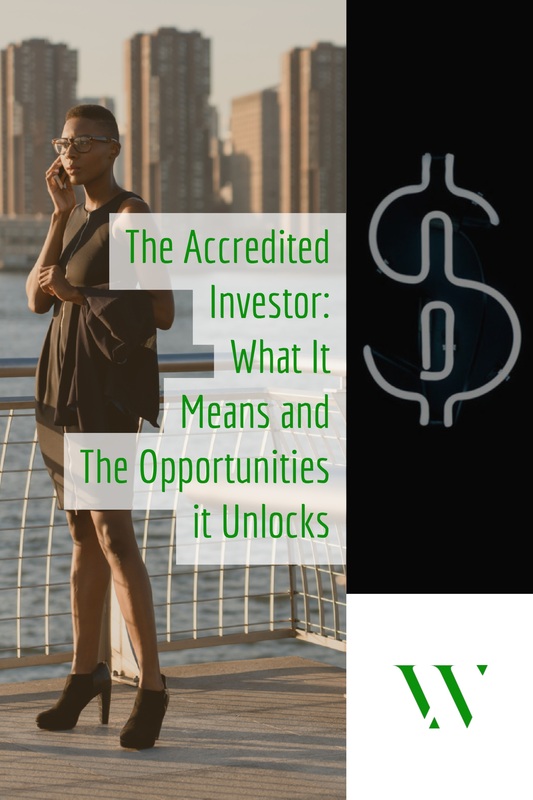 There is an entirely new universe of investments that is unlocked once you reach accreditation. But, they are also higher risk investments that require much more due diligence. If you are willing to put in the effort, you can significantly increase how quickly you build wealth. Check Out: Should Life Insurance Be a Part of Your Wealth Journey? What Can I Do to Become an Accredited Investor? Not every career will pay these salaries, but for some of us, they will. Lawyers, doctors, engineers, tech sector employees, financial services workers and more have the opportunity to reach accreditation just through their primary jobs. Check out what we’ve said before about how to earn more and maximize your salary for ideas. You can also start a second business or do consulting work which may bring you enough income when combined with your salary. Building your net worth is the preferred method for obtaining accreditation because we all know that wealth is net worth and we’re about building wealth. Your salary can be taken away from you, but you have to lose your net worth on your own. Building your net worth is what we’ve discussed at Wealth Noir: spend less, invest more in assets and manage your investments. No easy or quick tricks here, but real estate, in my opinion, does offer the quickest risk-adjusted path through forced appreciation. The newest option for becoming an accredited investor, the knowledge requirement, is also the vaguest. While I’m sure a CFP (Certified Financial Planner) certification will meet the bar, it’s a multi-year and career changing investment. The simpler Series 65 may suffice, but it’s unclear. In most cases, you will probably need to convince each fund, platform or investment you can meet the bar. But the knowledge requirement for becoming accredited is blatantly the most accessible and worth researching. Now, I’ve managed to reach accredited investor status and am just learning of the smorgasbord of opportunities available to me. Because real estate is in my blood and the thing I love, it’s now where I spend most of my attention. But after all these years working in big tech, venture capital and seed investing are interesting. 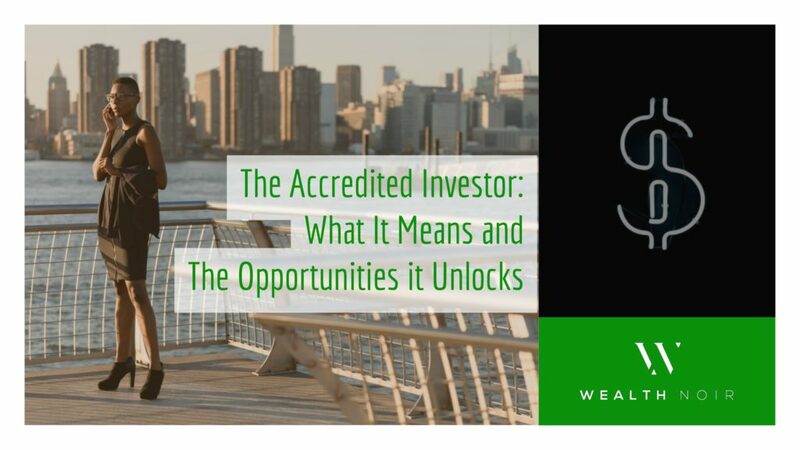 Have you thought about becoming an accredited investor? Have questions about what else it could do for you? Leave a comment for the community, and let’s talk. I’m new to investing but I really like to learn more about real estate investing. I’m currently saving money for my first renter. I am also learning about tax liens. Is it better if I get a CFP certification with my MBA? BiggerPockets is my absolute favorite resource for starting in real estate investing. Their books are very approachable, their forums are good, and the podcast is on point. I have an MBA and have considered a CFP. You can’t just get a CFP though, you do need to have work experience that qualifies and was a hurdle for me. CFPs and MBAs are very different things with very different purposes. I would say a CFP if you want to do financial advisory and an MBA if you want to be in the business of business. So, is there an official certification process if you already qualify under one of these categories? The actual certification is done by the investment company trying to bring you on as a client. For example, RealyShares scheduled a call with me and asked me a bunch of questions, whereas PeerStreet just had me answer some questions online. Great article! Do you suggest one of these platforms over the other as a place to get started? I want to get directly involved in local REITs if I can… didn’t know the “knowledge path” was an option! I don’t know all the platforms intimately … yet. RealtyShares and RealtyMogul have gotten most of my attention, but there are a lot of options depending on what you want to do. There are a lot of review online that can help explain the different types of crowdfunded real estate sites. Working on some reviews for Wealth Noir soon. A great early seed investment site that has accredited investor opportunities is startengine.com, its more like a VC site and also has investments available under the jobs act so no accredited investors can also participate in some of the opportunities. I’ve seen a few of these and have started to look more into them. Personally, I’ve been more interested in the small VC funds that are raising, as it can diversify your investments with less capital than doing a bunch of deals independently.